High Temperature and Autoclave Casters here, Fast Shipping, Low prices and a wide selection. Investing in the proper equipment for the job can be more expensive at first, but in the long run it will be safer and more cost effective. Do you use casters and wheels in high temperature or extreme heat applications like bakeries, autoclaves or powder coat ovens? 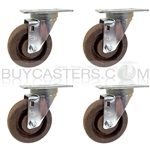 If so, Buy Casters' offers several options for extreme heat applications from high temp phenolic resin wheels for dry heat or glass filled nylon Brimstone wheels for moist/ humid high heat applications. The nylon and phenolic wheels also give more floor protection than steel and will not spark. While these products may cost a bit more now, they will save you from having to replace your wheels and casters more often. Whether you have swivel or rigid casters, stem or plate mount casters, medium, light or heavy duty, if your wheels are not rated for high temperature they will degrade quickly, from drying and cracking to all out failure. These wheels and caster combinations can handle heat up to 550f Intermittently and 475f Continuously (maximum 30 minutes), when coupled with high temp grease in the axle bearings and swivel raceway bearings. If you have an application that requires continuous high temps that exceed 475f for more than 30 minutes please call and we will discuss the option available. These caster wheels have extremely high weight capacities as well, especially if you are using ductile or drop forged steel. Casters with Nylon or Phenolic wheels are better used on smooth surfaces, due to the resin and composite construction of these wheels, rough surfaces and uneven floor transitions coupled with heavy loads can reduce the life of the wheels. If you have rough flooring a metal wheel like Ductile steel, cast iron or drop forged steel may be necessary. If you are in need of high temperature wheels and casters but are not sure what is right for you, we can help keep you rolling, we have a large selection of specialty casters and wheels in stock and ready to ship. We build each caster to your specifications, if you need a lock or brake we have it, if you need plain bore or bearings we can help.